Leading Manufacturer of triple offset butterfly valve from Chennai. Since the incorporation of our organization, we are offering Triple Offset Butterfly Valve to our clients. Treated with heat, this butterfly valve has been designed for long term application. This vale is available in different size range and has smooth texture and excellent quality. 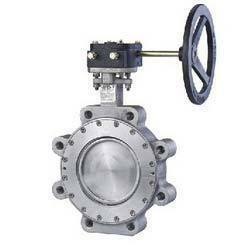 This butterfly valve is able to give best performance for years. This butterfly valve is offered in series 50, 52 and 40, 41 and 42. It has mounted pad. This butterfly valve is free from defects. Looking for TRIPLE OFFSET BUTTERFLY VALVE ?